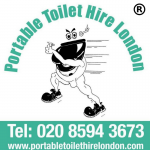 Portable Toilet Hire London is based in Barking, Essex. About us. Our professional team travel throughout London, Essex and the surrounding areas. Long or short term projects. 24/7 Emergency Services and Same Day Delivery, offering you Portable Toilets, Disabled Toilets, Colour Coordinated Toilets and Urinals. If you'd like to learn more about us, take a look at our portable toilet hire services.